Stephen Charrier, President of Rollerblade USA, and Rob Gill, of InlineSkates.com, review the 2015 Rollerblade Zetrablade Mens and Womens Inline Skates. Hey, I'm Rob from inlineskates.com joined today by Steven Cherrier - president of Rollerblade. Steven, thanks for being here. Thank you for having me. So, we're talking about the Zetrablade men's and women's skate. This is kind of that entry-level, into the fitness lineup for Rollerblade. It is. It's actually the first price-point Rollerblade adult skate. The thing I'd say about the Zetrablade that's great is this skate's has a lot of support in it. If you just squeeze the cuff on it and feel how firm this skate is. It really helps that skater who is learning to skate or refining their technique. Another thing on the product is that it's very well balanced so when you stand on this skate, it's going to be easier to learn technique, learning the turn, learning to brake. So, it's offering a lot of support for people that need and are looking for it. And that's key because you can develop some really bad habits in skating. I played hockey my whole life and you see it, if you don't have that support that you need, you can develop really bad habits in your skating technique and it's really hard to overcome those as time goes on. Yeah, so that maybe insecure skater is going to stand on a Zetrablade and feel really solid and firm underneath their foot. For sure. Just looking at the specs on this skate - we have an 80mm wheel with a Rollerblade SG5 bearing so this skate's going to roll nice and smoothly. It has a composite frame so really solid feel overall the way this skate's going to perform. For sure. And help absorb a little bit of the shock that you get rolling around on the pavement too, right? Absolutely. This skate's, like I said, a really secure to it. It has a Powerstrap over the instep, upper buckle and a lace system on it. And it has the 5 Star Fit Liner in there so it's a good, solid high-quality product. Yeah, very comfortable feet especially for someone that's new to being on their fit for maybe this type of time, working out like this. Yep, this is obviously the men's color here in the orange and this is the women's. For sure. And so who would you gear this skate for? Again, it will fit a wide audience of skaters but someone who's, again, learning to skate or refining their technique, it's perfect for them. Someone who's an occasional skate, it's great for that. If they're going to skate a lot, they should probably look a little higher up the line. For sure. 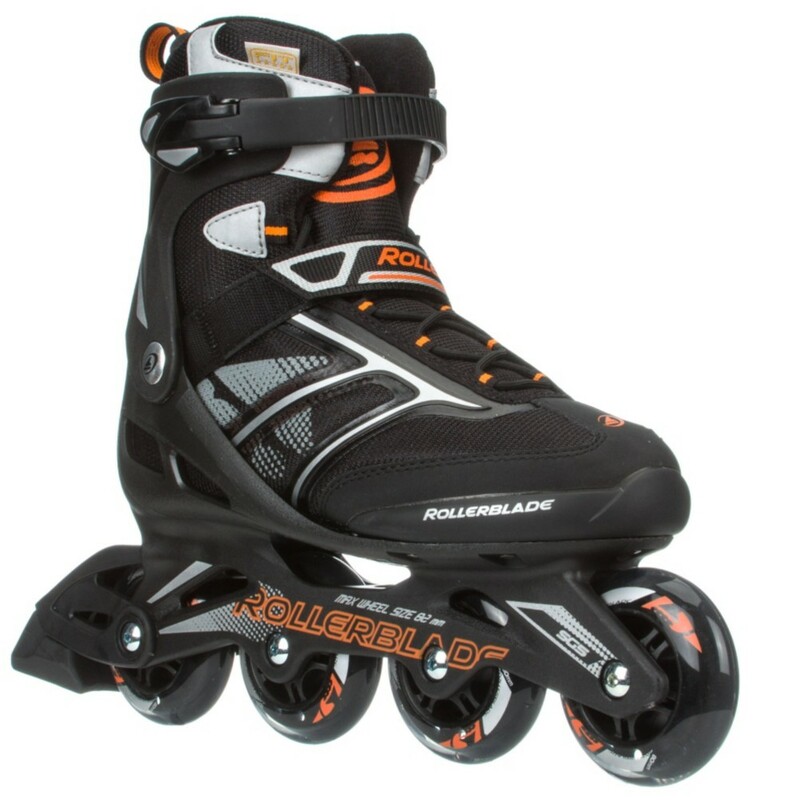 So, there you have it - the Zetrablade men's and women's skates from Rollerblade. You can check them out on inlineskates.com.